I just stumbled upon this website. First, I must say it looks great. Well done. And I had to post this for you all. And here is a closer look. Yes, masking tape, wire nuts, but HEY .. they were thoughtful enough to separate the conductors that ran OVER the cleat so when they got pinched, they didn't spark too badly. Thanks all & be safe.. Thank you, Paul, and welcome to ECN! Welcome aboard -- Excellent choice of name, by the way! 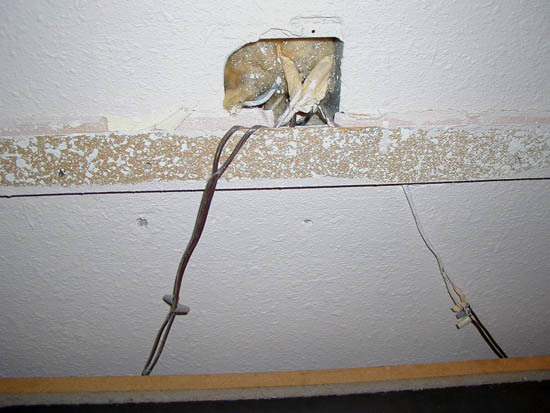 It's good to know that this wonderful piece of electrical workmanship was only inches above your head, isn't it? Did they reckon that hardwiring would deter people from leaving with the bedside lamps as well as the soap and towels? Is there a box missing(using only a plaster ring)in that installation or did they fill the box with fiberglass insulation? Someone was in a hurry there. Nice one Paul- BTW Welcome to the group. Excellent choice of name, by the way! Crikey there's more of them, soon we're going to have more Paul's than Scott's here!. those bed covers look peculiarly familiar to a national chain of motels ive stayed with at times... It must have something to do with "Leaving the light on for ya..."
Thanks for the warm welcome everyone. I suppose there is no reason to not say that this was a Ramada - not a cheap one either. I told the front desk and have written to Ramada twice with no reply. Yes, there was a 4x4 box in the wall (you can see one screw hole in the top right) but the left side is plastered over and the bottom two are covered by the headboard cleat. 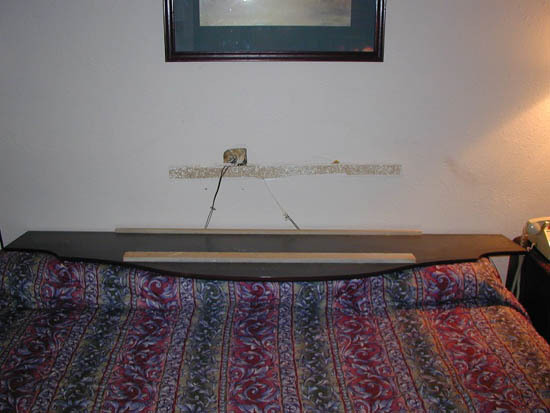 Needless to say, I made sure the smoke alarm worked and slept that night with the headboard off the wall & the bed moved away from the wall. The wires running over the cleat were bad enough, but the ones pinched between the wall and the cleat (also had a nail right in line with them) worried me more. Be safe y'all , and thanks again. My money says this is the work of the maintenance "engineers", and yes, they do call them engineers for some reason only known to god. As a soon-to-be-former maintenance tech. myself, I can say with absolute certainty that most of these folks only know just enough to be dangerous.